New York City buses serve more than two million trips on an average weekday — more than twice the ridership as Los Angeles, which has the nation’s second-largest bus system. And yet the city’s buses are also notoriously slow and unreliable. Gridlocked traffic, long boarding queues, and the succession of traffic lights bog down surface transit in NYC and keep many New Yorkers from riding the bus. This may be part of the reason why bus ridership has dipped seven percent since 2007, even as subway ridership is up 9 percent. NYC DOT and the MTA have rolled out seven Select Bus Service lines that bypass congestion with dedicated lanes and tame boarding delays with pre-paid fare collection. The de Blasio administration plans to build out at least 13 more SBS lines — an important effort — but some of these gains in bus speeds can be realized without being tied to an SBS project. Specifically, DOT could quickly improve bus speeds across the city by making a relatively small investment in traffic signal priority. Traffic signal priority is simply a system for extending the green cycle of a traffic light when a bus is approaching the intersection, reducing the amount of time the bus is stopped at red lights. 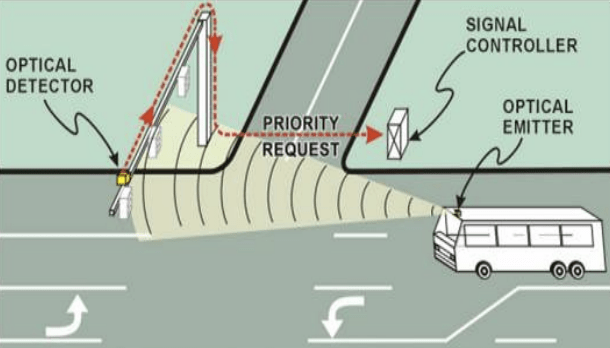 Buses are equipped with transmitters that communicate with sensors affixed to the traffic signal. The city currently uses signal priority on three of its Select Bus Service routes, at a cost that ranges between $1 million and $2 million dollars per route. Signal priority has increased bus speeds by about 10 percent on the three routes using the technology, according to DOT. Signal priority has sped buses on Victory Boulevard in Staten Island by 11 percent during the evening rush and 17 percent in the mornings [PDF]. Given the relatively low cost of implementing signal priority, the city should aggressively apply the technology to more bus lines city wide, beginning with those with the highest ridership or slowest average speeds. The city has been slow to implement the technology on some Select Bus Service routes, though it plans to extend it to three more lines. The M15 only has signal priority south of Houston Street. There is no signal priority on the Webster Avenue line in the Bronx, though Select Bus Service has been operating there for nearly a year. DOT says the process is underway to implement signal priority on the Nostrand/Rogers Avenue line, Hylan Boulevard, and Webster Avenue. The city is also planning to implement signal priority on non-SBS routes like the B46 on Utica Avenue, the city’s second-busiest bus line. Widespread implementation of traffic signal priority would not require the lengthy community board process that has slowed the rollout of new Select Bus Service routes, so it could be done relatively quickly. For less than $10 million a year, the city could improve speeds for hundreds of thousands of daily riders. Of course, signal priority is not a substitute for the city’s efforts to build out a world-class bus rapid transit network. Select Bus Service lines get additional performance boosts from the off-board fare payment and dedicated bus lanes. Extending off-board fare payment beyond SBS lines would also significantly increase bus speeds, but the MTA plans on replacing its fare payment system by 2019 and is reluctant to invest in fare payment machines that may be obsolete in a few years time. In the interim, traffic signal priority is a good solution to improve bus speeds and reliability. By making it happen Mayor de Blasio would have the appreciation of the one million or more New Yorkers who rely on the bus every weekday. They’re probably hesitant to do so on routes that have carefully-calibrated synchronized lights. They already take priority! It’s called damn the reds full speed ahead! Seriously, MTA busses run STEADY reds all the time! Seems like this wouldn’t be as effective for routes that don’t have bus lanes, since the bus could be stuck behind traffic and not able to change the light several blocks ahead. But it certainly makes sense on routes that have bus lanes! Good thing for two reasons. One, it’ll obviously decrease running times, possibly by substantial margins. Two, it’ll make things safer as buses will no longer need to speed to make lights, or even worse run through steady reds as I’ve seen them do many times. I was on the M15 SBS today from 50th to 23rd and it was so slow, took close to 30 minutes. The dedicated lane doesn’t exist in the middle of the day and of course there’s no ticketing of double parked cars. Stopped at most of the lights. Besides the pre-payment, which isn’t as useful with the lighter mid-day crowds, there’s really nothing moving this bus along any faster than the limited. Waited 10 minutes for an M2 yesterday at 58th and Madison, which was too crowded for me to board. Then 45 minutes for the next one. 55 minutes to get a bus. The last thing alone makes it worth it. It may not be as effective, but being able to go through the lights before everyone else is still really, really helpful. Dedicated lanes may not be possible or warranted on all bus routes, but the ability to shortcut lights saves time. Saved time can be like adding capacity without requiring more equipment. All vehicles, including buses, should go slowly on Manhattan streets. That’s the only way we will get to zero traffic deaths. At least half the city has realized that we need a new vision for city streets if we are going to make our streets safe for pedestrians. The other half, including many of our engineers, still thinks streets should be made for unimpeded, fast traffic flow. That’s one of the main reasons why we have so many deaths on our streets. The MTA’s line is that north of Houston the m15 takes advantage of “passive” transit signal priority — i.e. the same “green wave” signal timing as the rest of traffic. Really they just need to enforce a real bus-only lane to improve service. All-Door Boarding Works. Why Won’t the MTA Commit to It on Every Bus?